Sometimes it feels just wrong, and still can be right. Paul and Max are discussing the upcoming homebrewer's meeting. 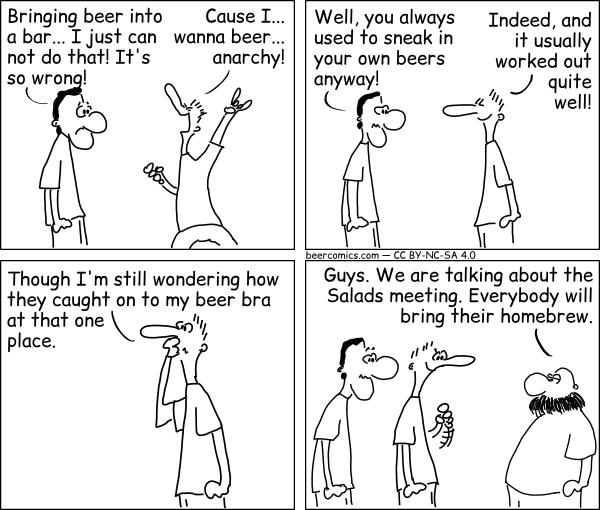 Paul: Bringing beer into a bar... I just can not do that! It's so wrong! Max: 'Cause I... wanna beer... anarchy! Paul: Well, you always used to sneak in your own beers anyway! Max: Indeed, and it usually worked out quite well! Max: Though I'm still wondering how they caught on to my beer bra at that one place. Homebrew store employee: Guys. We are talking about the Salads meeting. Everybody will bring their homebrew. I cannot do that by Robert Wenner is licensed under a Creative Commons Attribution - NonCommercial - ShareAlike 4.0 International License. Permissions beyond the scope of this license may be available upon request at https://beercomics.com/imprint.html.